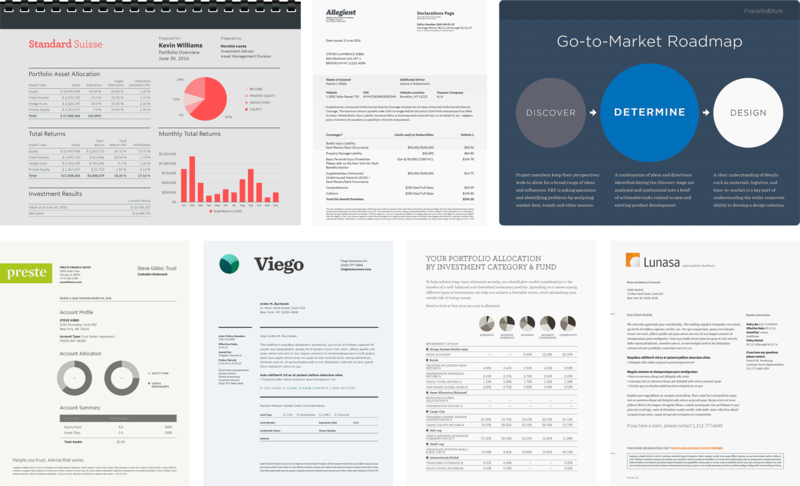 News, Notes & Observations | Hoefler & Co.
Every organization should brand its custom collateral: the proposals, statements, presentations and reports through which it communicates the most. Office Fonts from H&Co can help: they’re specially designed for users of Microsoft® Word, Excel®, Powerpoint®, Pages®, Numbers®, and Keynote®, the business software that runs typography’s last mile. You know this company: their logo’s in Gotham, their website’s in Gotham, there’s Gotham in their outdoor advertising and their television spots. There’s Gotham in the window of every branch, and inside, Gotham on the in-store displays and the printed brochures. And then the estimate you’re given from their sales associate will be in Arial, your sign-up contract in Times Roman, and your next two years of monthly statements in something someone picked at the lettershop. Typography can be the least expensive and most effective way of reinforcing a brand, or the quickest way to dilute it. Office Fonts from H&Co allow everyone who speaks for the brand to use the same consistent voice. They’re adaptations of some of our most popular typefaces, specifically created for use in the applications that generate personalized communications. They allow an organization’s branding to extend beyond the projects that designers themselves create, to include the reports, proposals, statements, and presentations prepared by non-designers — often the bulk of how any organization communicates. People use the fonts that are easiest: the ones that live in their font menus, work in their software, look good on screen, and behave in familiar ways. H&Co’s Office Fonts are designed for people who use word processors, spreadsheets, and presentation packages, allowing them to participate in the brand typography. — Familiar Families. No one looking for “regular type” should have to choose between Book and Medium. In place of the more detailed palette of styles that can be confusing for both businesspeople and their software, H&Co’s Office Fonts are provided in the customary four-style arrangement of Regular, Italic, Bold, and Bold Italic. Bold and Italic styles are mapped to the standard keyboard shortcuts B and I, to avoid the artificially “smeared” and “sloped” romans for which office documents are notorious. 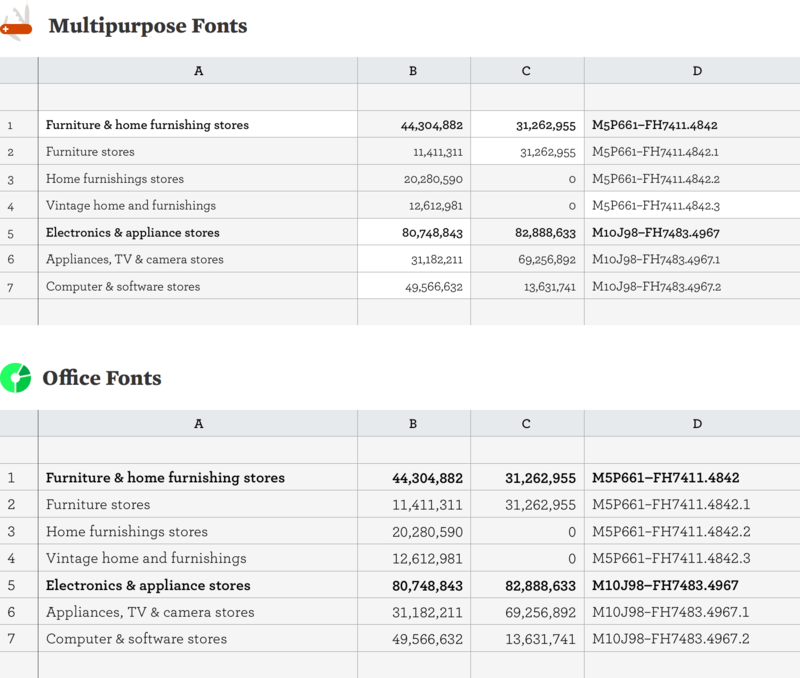 Above, a comparison of designers’ Multipurpose fonts with the Office Fonts designed for business users. — Enhanced Clarity. H&Co’s Office Fonts have a larger lowercase, a more generous fit, and clearer gestures, making them easier to read both on screen and in print (compare the A columns, above.) They have a heightened contrast between regular and bold styles, to make boldface type unambiguous (A1), and are engineered with ScreenSmart™ technology to render crisp and clear text on Windows. — Friendly Features. Only a designer should have to contend with old-style figures, lining figures, or tabular figures. Office Fonts from H&Co include one and only one set of numbers, built on a fixed width to ensure that columns of numbers align neatly (B). Numbers are designed to the same width across all styles in a family, ensuring that highlighting text in boldface won’t disrupt the grid (C). And all Office Fonts feature numbers that coordinate with both lowercase and capital letters, making complex syntax easier to read (D). — Compatibility. Office Fonts from H&Co are produced in TrueType format, to support even the simplest (and oldest) business applications. The same font files can be installed on either Mac or Windows, making asset management and deployment easier. Today we’re introducing twelve families of Office Fonts, all of them available for purchase and download. Some coordinate with our best-known typefaces (which serve the world’s best-known brands), Office Fonts for Gotham, Archer, Whitney and Sentinel. We’re also introducing Office Fonts for some of our newest releases, including this year’s Whitney Narrow and Operator. Below is just a taste of what Office Fonts can do. Office Fonts by H&Co, from $199. Exclusively at typography.com. The Whitney typeface has always been an adroit multitasker. Having grown out of a commission from New York’s Whitney Museum, the typeface was designed to serve two masters: the museum’s publications department, which needed a design both compact and energetic, and the facility’s public signage, which above all required legibility and sturdiness. A later addition designed for headlines, the six-style Whitney Condensed family, made Whitney an even more valuable tool for both publishers and brands. But one challenge that Whitney has never confronted is the narrow column. As editorial designers know, narrow columns are the bugbear of typography: they’re hostile to wide typefaces, perverting text with overzealous hyphenation, and often demanding that headlines be craftily written. Designers, developers, publishers, and brands now face the challenge of narrow columns every day in the form of the mobile phone: with the ascendancy of apps and the mobile web, fonts are routinely set on a two-inch measure. For these applications — as well as the narrow columns that permeate magazine sidebars and captions, paper packaging, data visualizations, and product literature — we’ve created the compact and economical Whitney Narrow®. Whitney Narrow was designed to thrive at sizes both large and small. At small sizes, it excels not only in text and informational typography such as charts and graphs, but for rendering the growing universe of fine print that’s often required but infrequently read: the ingredient lists, nutritional information, regulatory notices, disclaimers, and copyright legends that attract compact typefaces. In print, Whitney Narrow renders this fine print with clarity and warmth. For the screen, we’ve created the companion Whitney Narrow ScreenSmart family, a collection of twelve screen-optimized typefaces that’s designed and engineered to perform at sizes as small as nine pixels. The angled stroke endings in Whitney Narrow can be turned on or off. 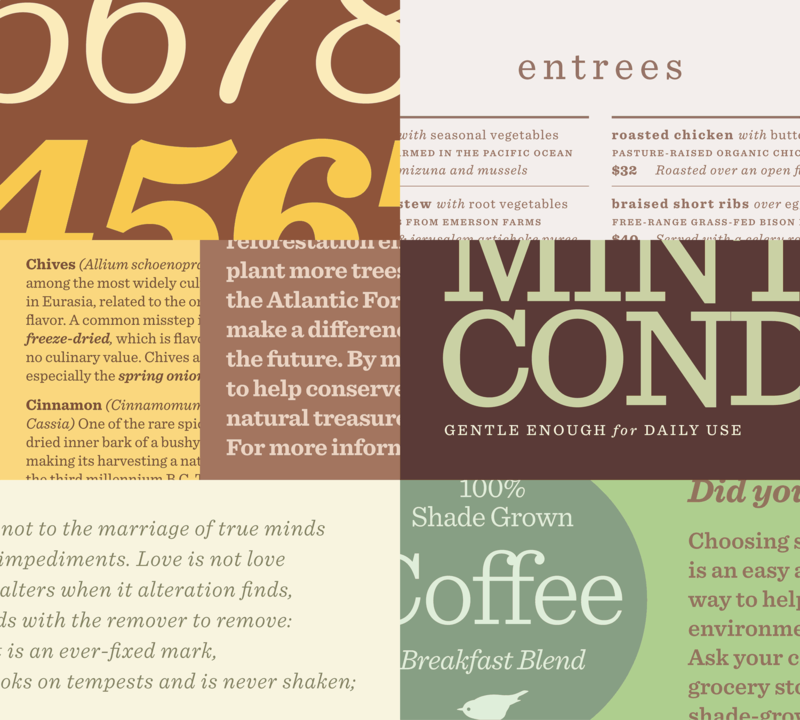 At headline sizes, Whitney Narrow makes a hale companion to the regular-width Whitney. It preserves Whitney’s angular motif (originally inspired by the iconic geometry of Marcel Breuer’s Madison Avenue museum), and features an option to disable these details when they’re not wanted. Above, Whitney Narrow Bold in two different moods: jaunty with its angled stroke endings, and sober without them. These gestures appear in 231 different characters, but can be quieted with a single setting in any application that supports OpenType Stylistic Sets, such as Adobe InDesign, and the Cloud.typography webfont dashboard. Whitney Narrow by H&Co. From $199, exclusively at typography.com. A monospace typeface, a monospace-inspired typeface, and a short film about type design. About two years ago, H&Co Senior Designer Andy Clymer proposed that we design a monospace typeface. Monospace (or “fixed-width”) typefaces have a unique place in the culture: their most famous ancestor is the typewriter, and they remain the style that designers reach for when they want to remind readers about the author behind the words. Typewriter faces have become part of the aesthetic of journalism, fundraising, law, academia, and politics; a dressier alternative to handwriting, but still less formal than something set in type, they’re an invaluable tool for designers. I acutely felt the need for such a typeface, and immediately thought of places I’d want to use it on Discover.typography. And while I liked the idea of creating a new typeface that would have this kind of voice — minus the nostalgic clackety-clack look of an actual typewriter face — I wondered if we could achieve these results without the many compromises required of a fixed-width design. Fixed-width faces force every character into a box of the same size, creating charmingly long serifs on the capital I, but tragic, procrustean disfigurements of wider letters like M and W. So I suggested that we relax the system, to create a font that feels monospaced, but behaves more professionally. Andy made an equally compelling counterproposal, reminding me that the command-line editor — these days, home to so many people who design things — could really be improved by a fully fixed-width typeface. What if, in addition to shedding the unwanted baggage of the typewriter, we also looked to the programming environment as a place where type could make a difference? 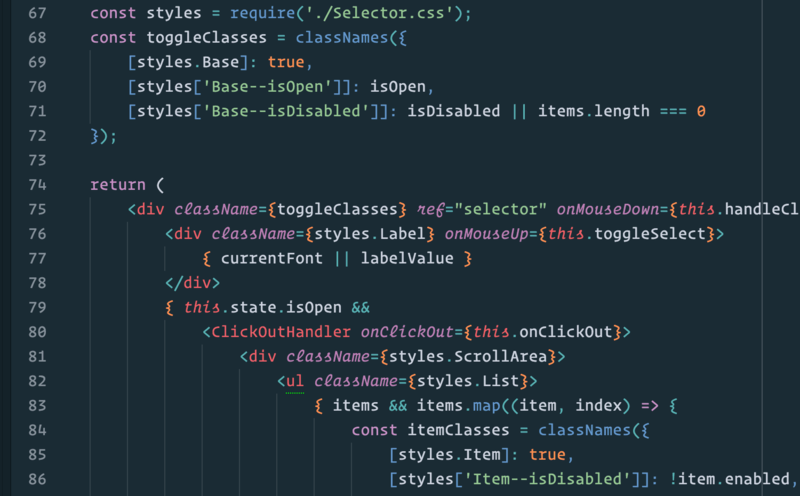 Like many screen fonts before it, Operator could pay extra attention to the brackets and braces and punctuation marks more critical in code than in text. But if Operator took the unusual step of looking not only to serifs and sans serifs, but to script typefaces for inspiration, it could do a lot more. It could render the easily-confused I, l, and 1 far less ambiguous. It could help “color” syntax in a way that transcends the actual use of color, ensuring that different parts of a program are easier to identify. Andy hoped this might be useful when a technical pdf found its way to a black-and-white laser printer. It was an especially meaningful gesture to me, as someone who, like three hundred million others, is red-green colorblind. The Atom development environment, configured to use Operator Mono. The family’s distinctive italics make it easier to spot the names of attributes. So with designers, developers, and most of all readers in mind, we decided to design it both ways. Operator Mono® is our new family of fixed-width typefaces, with a broader range of weights than a typical typewriter face, and an italic that positively shines in code. Its more editorial companion is the natural-width Operator® family, which offers the voice of typewriting but none of the compromises. Operator extends to nine weights, from Thin to Ultra, and includes both roman and italic small caps throughout. Both families are supported by companion ScreenSmart fonts, specially designed and engineered for use in the browser at text sizes. Operator by H&Co. From $199, exclusively at typography.com. Now Gotham’s more cosmopolitan than ever: starting today, the entire family speaks another 60 languages, including Russian and Greek. H&Co is delighted to introduce a massive expansion of our Gotham family. With the addition of more than 29,000 character drawings, all 66 styles of Gotham — plus all 48 Gotham ScreenSmart fonts, specifically designed for the web — now feature the Cyrillic and Greek alphabets. These characters are now included standard in all Gotham packages. Today’s Gothams tackle sixty additional languages, including Greek, Russian, and a host of languages that use variants of the Cyrillic alphabet. Featuring H&Co’s Cyrillic-X™ spec, the fonts can render not only the major Balto-Slavic languages (Russian, Ukrainian, Serbian, Belarusian, Bulgarian and Macedonian), but also many of the more widely-spoken and under-served languages of Asia, from Abaza (48,000 speakers) to Uzbek (27 million.) In all, today’s enhancements help designers communicate with more than one quarter of a billion new readers worldwide. For those designers who have already purchased Gotham, we’re delighted to make these upgrades available free. We’re rolling out these upgrades today, so if you’ve purchased Gotham for your computer, sign in and visit your Font Library. 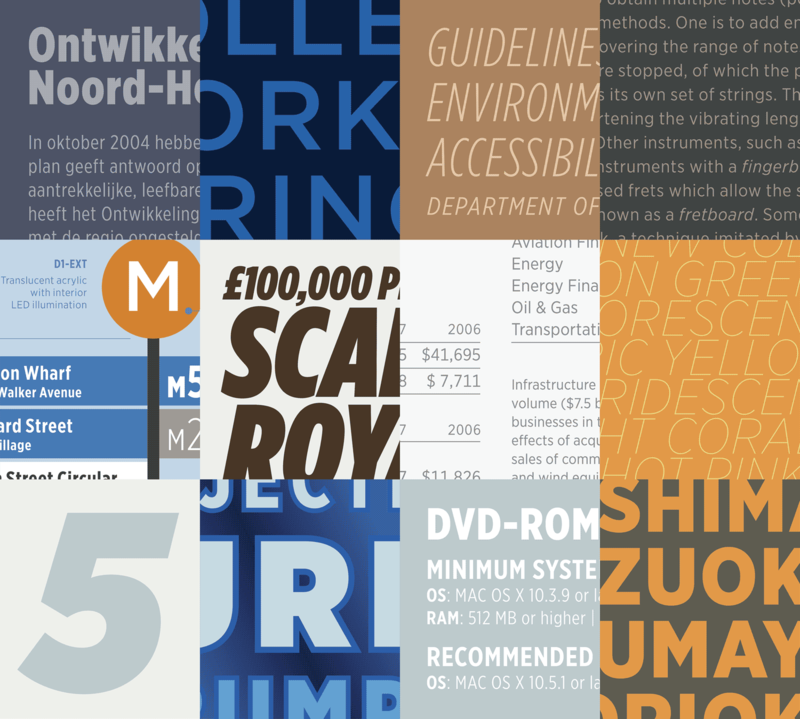 You’ll find a list of all your H&Co fonts, along with links to download their latest versions. If you’re using any of the Gotham webfonts via Cloud.typography, you’ll see an option within your project dashboards’ Character Set panel to add Greek, Basic Russian, or the full Extended Cyrillic set. And if you haven’t yet made Gotham a part of your collection, now’s the perfect time. Packages begin at $169, with savings of $69 when buying specially-priced Gotham Bundles — and an additional $100 when buying bundles together. Gotham with Greek & Cyrillic by H&Co. Exclusively at typography.com. We’re delighted to introduce Surveyor, a new family of fonts for print and web, and sizes large and small. I love maps, and not just for their vintage charm. I admire them as highly functional pieces of design, packing extraordinary amounts of information into small spaces, and invisibly educating readers about how they’re meant to be read. Spend a few moments with a map, and you’ll find that you’ve learned to distinguish counties, cities, and towns by the styles of type they use, without ever checking the legend. And these are just three of a typical map’s two dozen styles of lettering. Surveyor® is a new family of fonts inspired by the traditional mapmaker’s letter. It revives a style of lettering that’s unique to cartography, one that evolved in the early nineteenth century and endured for as long as maps were printed by engraving. Beyond reviving the shapes of these alphabets, Surveyor celebrates what maps do best, by providing an expressive typographic vocabulary to help designers articulate many different kinds of information. A peek at Surveyor’s style list hints at what’s possible. We’ve designed Surveyor in three optical sizes: a Text version for body copy, a Display cut for headlines, and a Fine for sizes larger still. Surveyor goes beyond the mapmaker’s roman and italic by including five weights, each of them outfitted with both roman and italic small caps, swash caps, and swash small caps. In its Text size, Surveyor features tabular figures, fractions, and symbols, to help it conquer the most demanding content. And for Cloud.typography users, we’ve created Surveyor ScreenSmart, a family of webfonts for text that contains all of these advanced typographic features, engineered to work in the browser at sizes as small as nine pixels. Surveyor by H&Co. From $199, exclusively at typography.com. A handmade typeface for a machine-made age: meet the new Ideal Sans family from H&Co, for print, web, and mobile. Typefaces are born from the struggle between rules and results. Squeezing a square about 1% helps it look more like a square; to appear the same height as a square, a circle must be measurably taller. The two strokes in an X aren’t the same thickness, nor are their parallel edges actually parallel; the vertical stems of a lowercase alphabet are thinner than those of its capitals; the ascender on a d isn’t the same length as the descender on a p, and so on. For the rational mind, type design can be a maddening game of drawing things differently in order to make them appear the same. Twenty-one years ago, we began tinkering with a sans serif alphabet to see just how far these optical illusions could be pushed. How asymmetrical could a letter O become, before the imbalance was noticeable? Could a serious sans serif, designed with high-minded intentions, be drawn without including a single straight line? This alphabet slowly marinated for a decade and a half, benefitting from periodic additions and improvements, until in 2006, Pentagram’s Abbott Miller proposed a project for the Art Institute of Chicago that resonated with these very ideas. As a part of Miller’s new identity for the museum, we revisited the design, and renovated it to help it better serve as the cornerstone of a larger family of fonts. Since then we’ve developed the project continuously, finding new opportunities to further refine its ideas, and extend its usefulness through new weights, new styles, and new features. Today, we’re delighted to introduce Ideal Sans®, this new font family in 48 styles. Ideal Sans is a meditation on the handmade, combining different characteristics of many different writing tools and techniques, in order to achieve a warm, organic, and hand-crafted feeling. It’s distinctive at large sizes and richly textured in small ones, and available today in packages starting at $149. Ideal Sans by H&Co. Exclusively at typography.com. We’re pleased to introduce an expansion of our Whitney® typeface, for our friends in Greece, Russia, Bulgaria, and the Commonwealth of Independent States. We’ve taken the fonts that already serve more than 140 languages, and extended them into the Greek and Cyrillic alphabets to satisfy sixty more. All editions of Whitney now feature both the Greek alphabet and our Cyrillic-X™ character set, accommodating not only major Slavic languages such as Russian and Ukrainian, but other important populations less well served by digital typography, like the 65,000,000 people who speak Azeri, Kazakh and Uzbek. For designers whose projects have an international scope, Whitney now covers all three official scripts of the European Union. The new, internationalized Whitney by H&Co. Exclusively at typography.com. Is any typeface more in-the-know than a Clarendon? These smart looking slab serifs have the timeless style of a charcoal gray suit, or a well-chosen pair of horn-rimmed glasses: they’re approachable, welcoming, and effortlessly persuasive. Yet they’re tough to use — out of the question for setting text — because they lack italics. Enter Sentinel®, a new slab serif from Hoefler&Co. A new take on this lovely and useful style, Sentinel is a refreshingly complete family in twelve weights (Light through Black, with italics throughout) that’s designed to shine in sizes both large and small. Featuring text-friendly features like short-ranging figures, and our Latin-X® character set for extended language support, H&Co is delighted to present the entire Sentinel family for just $199. Sentinel by H&Co. Exclusively at typography.com. The New Gothams: 46 New Fonts from H&Co. Fans of our Gotham typeface will be pleased to find that as of this morning, there are three times as many Gothams in the world as there were yesterday. Designers who work with Gotham have enthusiastically deployed the fonts in a range of environments. We’ve seen Gotham on soda cans, boarding passes, billboards and banner ads; we’ve seen it engraved in marble on a cornerstone, and cast in rubber on the sole of a shoe. One newspaper used Gotham for financial listings, another for saucy tabloid headlines. But what we see the most are designers facing the challenge of making one typeface work across all channels. Last year saw one of the most remarkable examples of this: journalists couldn’t stop writing about something that designers have always known, which is that a candidate for president should use the same font for everything, from lawn signs and flyers to the campaign’s website. Making a font work everywhere is a tall order. H&Co’s designers love these kinds of challenges, and are driven by an incurable compulsion to make fonts that can answer everyone’s needs. But designing a typeface is an arduous process requiring serious commitment, and we realized early on that if we weren’t careful, there could suddenly be an endless number of very specialized Gothams. The prospect of a “Gotham for embroidery” collection and a “Gotham for box scores” was daunting, and ran counter to one of H&Co’s core philosophies: that type families should be as small as possible, but as large as necessary. So we organized all of these ideas into a coherent design brief, mapped out a way to bring a larger Gotham family to life, and then devoted years to drawing the new fonts that we’re delighted to present today. Today’s Gotham contains a total of 66 styles, neatly organized into four widths: regular Gotham, the new Gotham Narrow and Extra Narrow, and the newly-expanded Gotham Condensed. 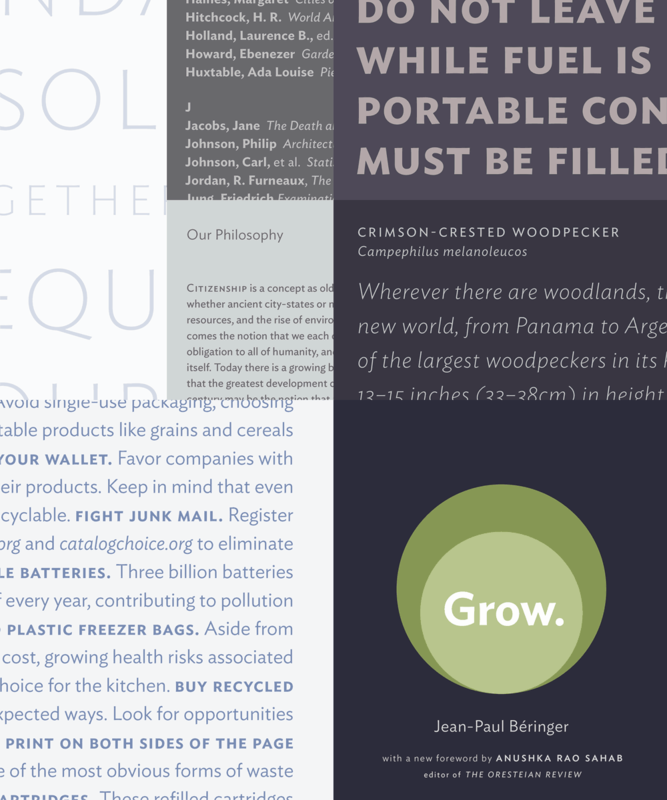 They’re available in packages starting at $169, exclusively from their designers at Hoefler&Co. The New Gothams by H&Co. Exclusively at typography.com. We’re delighted to introduce Archer®, a new slab serif in forty styles. Sweet but not saccharine, earnest but not grave, Archer is designed to hit just the right notes of forthrightness, credibility, and charm. Romans and italics in eight weights each, including a delicate hairline for display work, and featuring small caps, fractions, tabular figures, and our Latin-X® character set for extended language support. Now shipping in OpenType, with prices starting at $149, plus special savings when you order two or more Archer packages. Archer by H&Co. Exclusively at typography.com.